Perdido Key Florida beachfront luxury condo for sale at La Riva. For the discerning real estate investor, this exceptional penthouse condominium home offers the finest in luxury amenities anywhere on the Gulf Coast, Over 7,200 square feet of living space with 2 kitchens, 2 living areas, private roof top swimming pool, theater/media room, private steam room, over 3,000 sf. 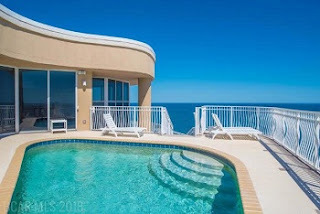 of balcony space, a 2 car garage, 5 bedrooms suites with full baths, 2 half baths, 2 laundry areas, and spectacular views of the Gulf of Mexico, bays, and surrounding area from this low density controlled access condo tower.